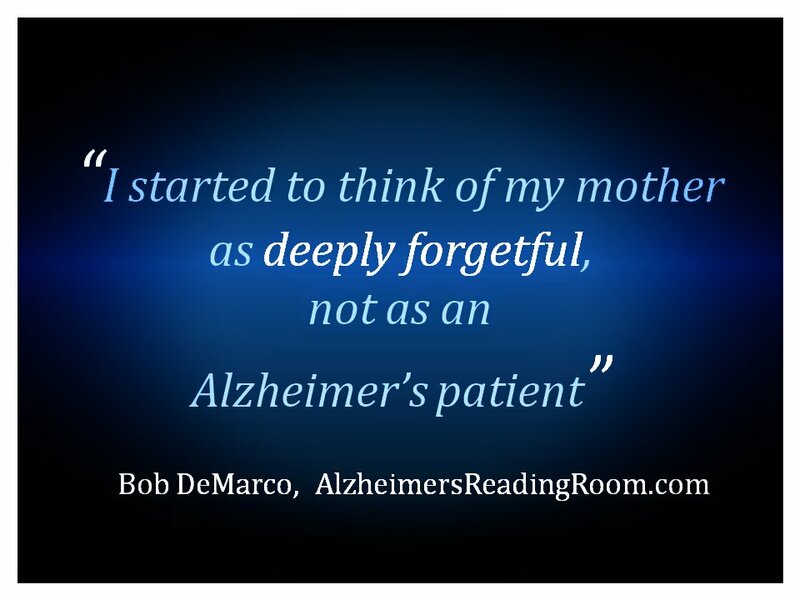 I started to think of my mother as deeply forgetful, not as an Alzheimer’s patient. I was interviewed by Lori La Bey on Alzheimer's Speaks Radio. I had no real expectation going into the interview. I should have known better. Lori caught me off guard when she asked me right up front to explain my construct of the deeply forgetful. Later in the day I realized I really couldn't remember what I said. I went back and listened to my own words. I surprised myself while listening. I now realized that caregivers are constrained by their own brains. We tend to view a person living with Alzheimer's or a related dementia as less than a "whole person". This is not true, or even close to being true. This is a rough transcript of what I said. Most Alzheimer's caregivers focus on and sometimes obsess about memory. By this I mean, they use post it notes and whiteboards to help AD patients remember. They say things like, “don’t you remember”, or “you just asked me that”. It is sometimes hard to comprehend that the deterioration of the right now memory is a given in AD. Right now memory goes first. I’ll interject here that I believe caregivers should focus on memories not memory. Music, pictures, and discussions of the way back past are good tools that can enliven the deeply forgetful. Enliven is a key word. I have a different view of dementia than most caregivers. specifically thinking, concentration, memory, judgment, and includes moodiness and challenging behavior. These all affects a person’s ability to perform normal daily activities. For example, It is not unusual for AD patients to forget the importance of taking a shower. You won’t get them to do what you want by trying to explain why they need to take a shower, or should take a shower. Or at least this didnt' work well for us. So, I decided to focus on what I call the deep forget. 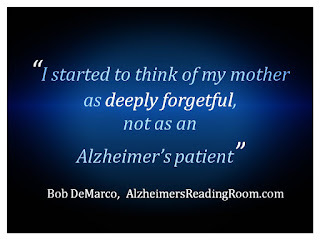 When I did this I started to think of my mother as deeply forgetful - not as an Alzheimer’s patient. So I embarked on a mission to help my mother remember how to do things. For example, in her normal everyday life my mother would wake up, read the newspaper, and then do the crossword puzzle. So we started each and every day by doing just that. I would discuss the front page with her, look at the recipe page and ask her to read the ingredients of a recipe to me, and then eventually put the crossword puzzle in front of her if she didn’t do it herself. As a result, Dotty never forgot how to read, and she could still get three letter words in the crossword puzzle even after she scored a 14 on the MMSE. Below 16 indicates moderate to severe dementia. I also placed a book on my mother’s pillow every night. She couldn’t remember a word she read, but she could still read, I watched her do it, I watched her dog ear the last page she read, and I watched her put the book down and turn off the light before she went to sleep. This explains in part why she could still read out loud if asked to, and why she could still hold a conversation. Most neurologists and geriatric care persons were amazed at her ability to read. If I had not done this I believe she would have forgotten how to read, and then probably how to speak full sentences. This did not happen to us. I didn’t want Dotty to forget, and I also didn’t care whether or not she could remember what she read. I could control the forgetting, I could not control her memory loss. Here is a good example of the difference between memory and forgetting. In 2010 as part of her testing my mother was shown a picture of a fork. She was asked "what is this" and "what do you do with it". She could not answer either question. Then she was handed a fork and asked to demonstrate what you do with it. She demonstrated how you use it to eat. She was then asked "what is it". She got a look on her face like she was being treated like an idiot. And then said, what do you think I am an idiot, this is a fork. That did tickle the woman giving the test. Couldn’t remember, but didn’t forget. Once I started viewing my mother as deeply forgetful, I forgot she had Alzheimer’s. This lifted a great burden off my back. The stigma attached to Alzheimer's is burdensome. Unfortunately, we as caregivers drink the kool-aid. We allow our brains to focus on the negative instead of focusing in on the right here and right now. We have allowed the money folks to taint our thinking and convince us that AD is an automatic death sentence. It is a nasty lie that is damaging to the entire Alzheimer's community. We are born and some day we die. In between we live our lives. The goal of every AD caregiver should be to live life along with their loved one - one day at a time. We can miss the "more there" easily because our brains our constrained and we are constantly bombarded by the many stigmas and misconceptions that are attached to Alzheimer's disease and related dementia.